This article is about the plant. For other uses, see Mustard. Brassica juncea, mustard greens, Indian mustard, Chinese mustard, Jie Cai (in Mandarin) or Kai Choi (in Cantonese), or leaf mustard is a species of mustard plant. Subvarieties include southern giant curled mustard, which resembles a headless cabbage such as kale, but with a distinct horseradish-mustard flavor. It is also known as green mustard cabbage. The leaves, the seeds, and the stem of this mustard variety are edible. The plant appears in some form in African, Pakistani, Bangladeshi, Italian, Indian, Chinese, Japanese, Korean, and African-American (soul food) cuisine. Cultivars of B. juncea are grown as greens, and for the production of oilseed. In Russia, this is the main variety grown for production of mustard oil. It is widely used in canning, baking and margarine production in Russia, and the majority of table mustard there is also made from this species of mustard plant. Because it may contain erucic acid, a potential toxin, mustard oil is restricted from import as a vegetable oil into the United States. Essential oil of mustard, however, is accepted as GRAS. The leaves are used in African cooking, and leaves, seeds, and stems are used in Indian cuisine, particularly in mountain regions of Nepal, as well as in the Punjab cuisine of India and Pakistan, where a famous dish called sarson da saag (mustard greens) is prepared. B. juncea subsp. tatsai, which has a particularly thick stem, is used to make the Indian pickle called achar, and the Chinese pickle zha cai. The mustard condiment made from the seeds of the B. juncea is called brown mustard and is considered to be more spicy than yellow mustard. The leaves and seeds are used in many Indian dishes. The Gorkhas of Darjeeling and Sikkim prepare pork with mustard greens (also called rayo in Nepali). It is usually eaten with relish with steamed rice, but could also be eaten with chapati (griddle breads). Brassica juncea is more pungent than the closely related Brassica oleracea greens (kale, cabbage, collard greens, et cetera), and is frequently mixed with these milder greens in a dish of "mixed greens", which may include wild greens such as dandelion. As with other greens in soul food cooking, mustard greens are generally flavored by being cooked for a long period with ham hocks or other smoked pork products. Mustard greens are high in vitamin A and vitamin K.
Chinese and Japanese cuisines also make use of mustard greens. In Japanese cuisine it is known as takana and is often pickled and used as filling in onigiri or as a condiment. A large variety of B. juncea cultivars are used, including zha cai, mizuna, takana (var. integrifolia), juk gai choy, and xuelihong. Asian mustard greens are most often stir-fried or pickled. A Southeast Asian dish called asam gai choy or kiam chai boey is often made with leftovers from a large meal. It involves stewing mustard greens with tamarind, dried chillies and leftover meat on the bone. Brassica juncea is also known as gai choi, siu gai choi, xaio jie cai, baby mustard, Chinese leaf mustard or mostaza. In 100 grams, cooked mustard greens provide 26 calories and are a rich source (20% or more of the Daily Value, DV) of vitamins A, C and K which is especially high as a multiple of its DV (table). Mustard greens are a moderate source of vitamin E and calcium (table). Greens are 92% water, 4.5% carbohydrates, 2.6% protein and 0.5% fat (table). Vegetable growers sometimes grow mustard as a green manure. Its main purpose is to act as a mulch, covering the soil to suppress weeds between crops. If grown as a green manure, the mustard plants are cut down at the base when sufficiently grown, and left to wither on the surface, continuing to act as a mulch until the next crop is due for sowing, when the mustard is dug in. In the UK, summer and autumn-sown mustard is cut down from October. April sowings can be cut down in June, keeping the ground clear for summer-sown crops. One of the disadvantages of mustard as a green manure is its propensity to harbor club root. 1 2 "Kai Choi - Your British Oriental Vegetable Grower". cherryfarms.co.uk. 1 2 "Detention Without Physical Examination of Expressed Mustard Oil". US Food and Drug Administration. 18 March 2011. Retrieved 1 February 2016. ↑ "Sarson Ka Saag". Retrieved 14 February 2014. ↑ Chandrassekaran, V. K. (February 24, 2013). "Flavour of Punjab". The Hindu. Retrieved 6 March 2013. ↑ Sakorn, P.; Rakariyatham, N. (June 13, 2012). "Biodegradation of glucosinolates in brown mustard seed meal (Brassica juncea) by Aspergillus sp. NR-4201 in liquid and solid-state cultures.". Biodegradation. 13 (6): 395–9. PMID 12713131. 1 2 editors, Naser A. Anjum...[et al. ], (2012). The plant family Brassicaceae contribution towards phytoremediation. Dordrecht: Springer. ISBN 9789400739130. ↑ Schneider, Thorsten; Haag-Kerwer, Angela; Maetz, Mischa; Niecke, Manfred; Povh, Bogdan; Rausch, Thomas; Schüßler, Arthur (September 1999). "Micro-PIXE studies of elemental distribution in Cd-accumulating Brassica juncea L.". Nuclear Instruments and Methods in Physics Research Section B: Beam Interactions with Materials and Atoms. 158 (1-4): 329–334. doi:10.1016/S0168-583X(99)00356-0. 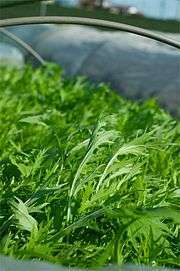 Mustard Green Manures: Washington State University Extension paper on cover crops.